Virginia and North Carolina’s Kerr Lake has produced the largest blue catfish ever – a 143-pound blue catfish – and while we flew cross country to film an episode of Pautzke Outdoors here if we were locals we would have cancelled yesterday’s session. There’s been no stability in the weather the past week. The barometer has fluctuated like tides on the nearby James River, storms have moved in and out daily, high winds have plagued angling and temperatures have shot from 80 degrees one afternoon to a high of mere 40 the next day. The fish are confused. Patterns haven’t been established and variables can’t find consistency. Being a veteran guide, Chris Bullock of Kerr Lake Crappie & Cats wasn’t prepared to put a stamp of success on the trip and warned us action might be brutally slow. Meanwhile, without the option of rescheduling (we got blown off an ocean-like Potomac River and scary looking James River the day prior) we launched on the Virginia side and tried our luck. Bullock wasted no time getting lines in the water. He opened a cooler, grabbed a few palm size crappie, placed them on a cutting board and sliced them apart with an electric Rapala fillet knife. “These are my baits,” he said, holding a piece of freshly cut crappie and pointing to a bag of dead shad he attained in a net. Bullock and guide Wes Jordan or Redbeard Cats orchestrated a congregation of rods off the back of the boat, carefully positioning to have one Catfish Nectar scented bait, and then a fresh, cut crappie. Every other rod had Catfish Nectar and every other had a fresh bait. We filmed the entire day to capture the results. Fortunately, we caught several cats on our first drift (Bullock trolls with planer boards rather than sitting on anchor. The thought process is to cover lots of water and locate active cats). Fortunately, action was more impressive than we expected. 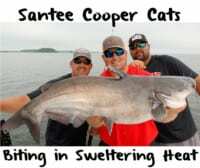 In fact, we caught three kitties on our first drift, all on the Catfish Nectar soaked baits. We fished on the Virginia side and found many aggressive blue cats during the first two hours before a long midday lull. Then, the late afternoon produced a flurry of action on mostly smaller cats (in fact, we even caught two, three-pound channels). While we didn’t catch any monsters, we left with plenty of action and much better than we expected given conditions. 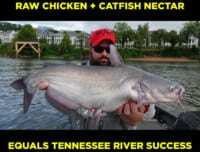 Fortunately for us, roughly 80 percent of the catfish that bit grabbed the Catfish Nectar soaked baits. Bullock’s gear was standard for catfish. He uses 10/0 Mustad Demon Perfect Circle hooks, Power Pro 65–pound braid as a main line and P-Line 40-pound monofilament for leader line. 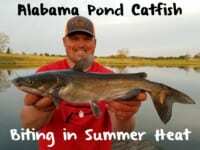 He employs Ugly Stick & Shakespeare eight-foot medium heavy rod and uses Team Catfish 2-ounce and homemade 2-ounce weights to get fresh cut crappie and Catfish Nectar marinated shad and crappie to the bottom. 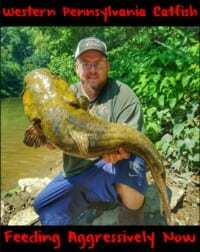 Editor’s Note: For more information on Chris Bullock’s Kerr Lake catfish trips please visit http://kerrcrappieandcats.com. Anglers may fish Kerr Lake with a North Carolian or Virginia fishing license.